Make brown butter chocolate chip cookies (and buy some salted caramel ice cream, too)! 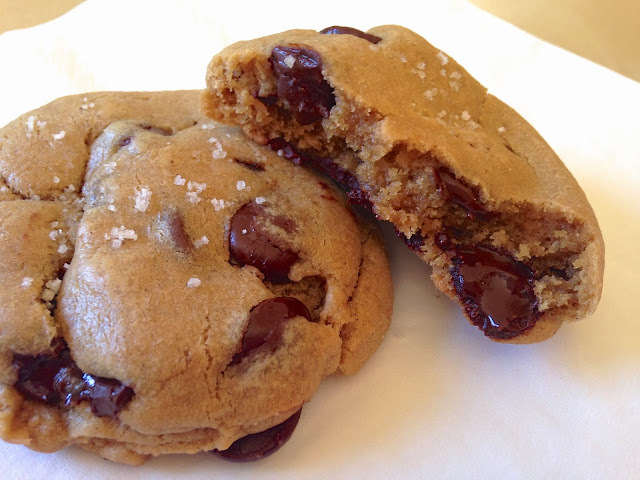 I have been on a quest for the "perfect chocolate chip cookie recipe" for over a decade. I have made countless batches of cookies, and I'm still not 100% satisfied with the numerous recipes I have tried. I have experimented by making the cookies with melted the butter, with room temperature butter, with light brown sugar, with dark brown sugar, by only mixing the ingredients with a wooden spoon, by using my Kitchenaid stand mixer, and so on and so on. I have heard that baking them on a baking stone makes all the difference, but I do not currently own a baking stone. Recently, I cleaned out my cupboards and noticed that I have an excessive amount of good quality chocolate chips. Obviously, this is a HIGH class problem. I made a mental note that I need an excuse to make more chocolate chip cookies. These excuses are pretty easy to come by, and a few days later I found a good one: my friend invited me over to dinner and mentioned that he had gotten everything except dessert. Few things are as comforting and friendly as home-baked cookies. They travel well, and you can leave the extras with your friend as a gift for the meal they prepared for you. In addition to the cookies, I decided I'd also pick up some ice cream (or gelato, technically). Have you ever had this? You haven't? You MUST. You have? HOW GOOD IS THIS GELATO? Even the cashier at Gelson's made a point of telling me that she was crazy about the stuff. It is especially good served with chocolate chip cookies. 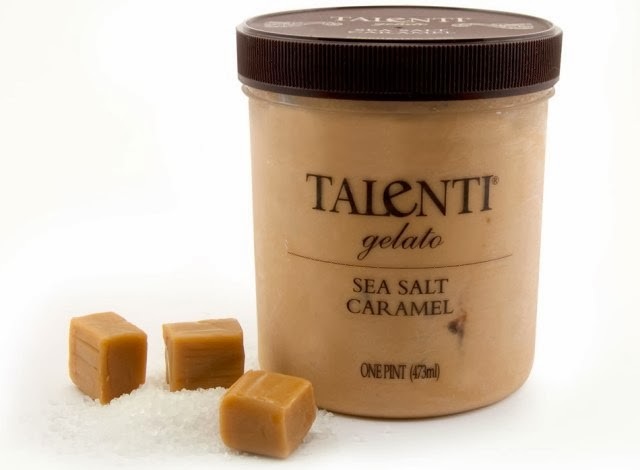 It is doubly especially good if those cookies are made with brown butter, which echoes the rich caramel flavor of gelato. This recipe is a variation of Nigella Lawson's from her excellent cookbook, Nigella Kitchen. She does not brown her butter, she uses zero salt (always bake with salt! it brings out the flavor in anything), she uses light instead of dark brown sugar, and she uses milk chocolate chips. I have tried the recipe exactly as written in her book, and the cookies were good. What am I looking for in my chocolate chip cookie? I want a crispy exterior and a soft interior. I thought this desire is universal. Nope! Many of my friends made it clear to me that they prefer a "well done" cookie as opposed to the soft and chewy cookie that I prefer. For instance, my Swiss neighbors informed me that soft cookies are considered inferior in Switzerland, because they are typically cookies that are left out in the air for days, and sold in mediocre markets. The recipe below makes a fairly firm cookie. It is just slightly firmer than I would like, but still a little soft in the center. I was happy enough with the results, and the Swiss neighbor approved. Maybe this is the type of cookie that will bring the cookie divide closer together? Also, I tried baking them in two different sizes, but that did not make much of a difference in terms of the textural outcome. This recipe still needs tweaking, but I am being picky. These cookies are damn good. Preheat the oven to 325 degrees Fahrenheit. Line a cookie sheet with parchment paper. In a saucepan on medium high heat, melt the butter and whisk it as it melts and browns. Once the butter is evenly browned and nutty, turn the heat off and allow it to cool slightly. Put the brown and white sugars into a large mixing bowl, pour the slightly cooled browned butter over the sugar. Beat the sugars and the butter together. I use a stand mixer for this, but you could do this with a handheld mixer, a whisk, or even a wooden spoon. Beat in the vanilla, the cold egg, and the cold egg yolk, until the mixture is light and creamy. Don't rush this process, really let the mixture get light and creamy. Sift the flour, baking soda, and salt into a bowl. Slowly add the dry ingredients to the wet ingredients until they are fully incorporated. Fold in the chocolate chips. Allow the batter to chill for 30 minutes. If you are really impatient, 15 minutes will suffice. Scoop the cookie dough into a quarter-cup measure or a 1/4 cup ice-cream scoop. 1/4 cup makes a large cookie, I also made these in 2-teaspoon sized scoops using a small ice-cream scoop. Choose your fancy... Plop the cookies down about 3 inches apart. Press them down just slightly, and lightly sprinkle flake sea salt or gray salt over the top. Keep the bowl of cookie dough in the refrigerator between batches. Bake for 15 minutes if your cookies are a 1/4-cup sized. Bake for 10 minutes if they are 2-teaspoon sized. Let the cookies cool in the pan for 3-5 minutes before transferring them onto a wire rack. If you just keep them cooling on the pan they will continue to cook... no bueno. Serve the cookies with salted caramel ice cream. Heaven.